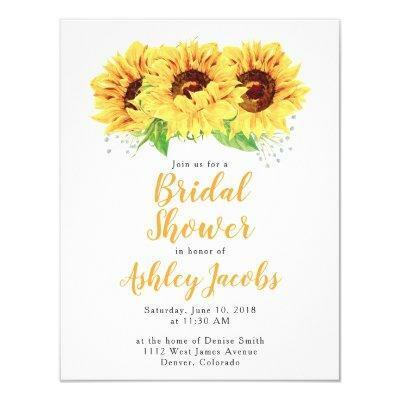 Yellow sunflower floral bridal shower or wedding shower invitation. This yellow, green, brown, and white sunflower wedding bridal shower invite is a good choice for a summer wedding shower or a fall / autumn wedding shower. This watercolor sunflower flower wedding shower invite features a beautiful watercolor yellow sunflower flower illustration. This sunflower wedding bridal shower invitation has a great country look, so it&#;s perfect for a country style bridal shower. It would also work for a rustic bridal shower. Further customizations are possible (font, font color, background colors, etc), by clicking on the "click to further customize link" below the personalize options. Contact the designer if you want any other matching items to go with this design that aren&#;t already included in the collection.